Every month, Lusikisiki Village Clinic serves up to 8,500 people in the OR Tambo District of the Eastern Cape. At the beginning of 2013, the Eastern Cape Department of Health moved the clinic from a building in central Lusikisiki to a plot of dirt on the outskirts of town. It threw up some tents and a mobile unit and walked away. Five months later – and despite TAC and SECTION27 drawing the situation to the attention of the MEC, the Minister and the media – there is no electricity. Running water is scarce and unreliable. People queue for hours in the hot sun or rain. The only toilet is a pit latrine perched above a steep embankment; one nurse broke her arm climbing up it. The pit latrine is full and maggots crawl around the rim of the toilet seat – people rather relieve themselves in the bush. Everyone can watch them, but it’s still better than the pit latrine. There’s also no privacy in the tents—anyone in the tent or queue can hear everything said to the nurses. People have two choices: disclose their personal medical issues publicly or forgo medical consultation at Village Clinic. Some choose not to discuss conditions like HIV or sexually transmitted infections. The HIV support group, which once thrived at the clinic’s old location, now meets in a patch of dirt out in the open. If you attend the support group, you tell your HIV status to the world. Attendance has petered out and the support group has all but collapsed. Because there is no private consultation area, nurses cannot screen for things like sexually transmitted infections. Instead, nurses prescribe medication on the basis of whispered descriptions of symptoms. Sadly, the medication is often unavailable. Frequent stockouts of essential medicines force patients to return again and again inquiring after medicines like ARVs and antibiotics. Improper storage facilities mean that medicines requiring cold storage are kept in a coolerbox and other medication bakes in the mobile unit. Condoms in visibly damp boxes steam in the sunlight. Large letters on the boxes say, “Store in a cool dry place. Keep away from sunlight”. It’s an instruction the nurses can’t follow—space won’t allow. The MEC has repeatedly, in writing, promised to fix this clinic. Since January 2013, the only progress he has made is to dig a pit for additional pit latrines (which he has not installed) and install two JoJo tanks and a tap for water. The water still runs out occasionally. The MEC’s own deadlines for improvements have passed again and again. MEC Gcobana – Is this what “delivery” of the “real deal” looks like? 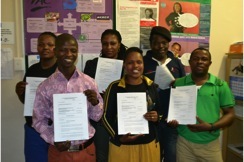 On 14 & 15 May 2013, 19 people signed affidavits describing the clinic and their experiences in it. The people of Lusikisiki cannot be deprived of dignity and decent health care services any longer. The time for false promises is over. Therefore, TAC will soon launch litigation against the Eastern Cape Department of Health to force the MEC to restore proper standards of care at the Village Clinic.